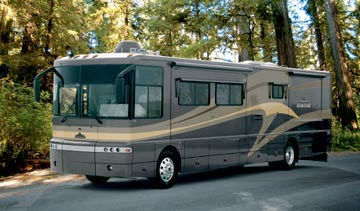 Traveling on the Alaska ferries with an RV, camper or 5th wheel has become so popular that each year demand for summer vehicle and cabin space begins earlier & earlier. If traveling from Anchorage or Fairbanks to Washington, consider the Whittier ferry to Juneau, then the Juneau ferry to Bellingham. This ferry route is more expensive than taking from ferry Haines to Bellingham, but it's a much shorter drive from Anchorage & Fairbanks, will save wear and tear on your rig & it is the only route that avoids Canada so enables you to travel without a passport. Alaska ferries do not travel to or from Seattle. Most vehicle ferries ( Alaska ferries & BC ferries ) can accommodate recreational vehicles & tows up to 70' long & 13' high. Anyone taking a vehicle up the Inside Passage during the high season, especially those driving large units, should reserve summer ferry space before February. To ensure vehicle & cabin space, 3 to 6 months in advance of sailing is almost mandatory. Overall length is the measurement from the front bumper of what is being driven, to the back bumper of anything being towed. If traveling with a tow, it is the bumper to bumper connected length that determines the vehicle fare. On any ferry, it is often less expensive to disconnect a tow and make two separate bookings. Propane tanks must be turned off when traveling on any ferry. Bottled gas containers will be sealed prior to boarding by terminal agents. Small portable containers of fuel (5 gallons or less and limited to 2 containers) must be properly sealed, labelled with the owner's name for ID, and stored by AMHS while on route. As all propane tanks are turned off during a voyage, it is important to stock up on ice if carrying perishables. Pets traveling into Alaska by ferry from another state or province, must have a health certificate no more than 30 days old. There is no charge for pets traveling on BC Ferries. While on-board, pets must stay on the vehicle deck but can be visited, fed & “watered” at regular intervals. Entry to the car deck is controlled by the ships purser. Because of the increasing popularity of the northern trips during the May – Sept period, vehicle & stateroom reservations for most ferries in Alaska and for the BC ferry between Port Hardy, Prince Rupert & Bella Coola in British Columbia Canada, should be booked before February. Passports are required when traveling between any two countries. US aliens are required to bring an Alien Registration Receipt Card as proof of residence. If crossing a border, all weapons must be declared and any appropriate paperwork shown.